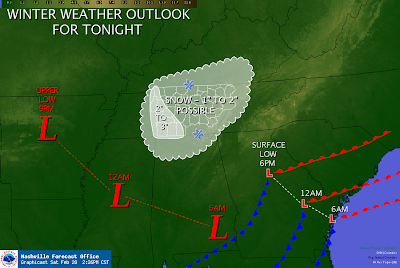 The Weather Guy: Snow Expectations Tonight..
Looks like most of Middle Tennessee will see a snow event overnight and into Sunday morning. It is already snowing in Memphis and extreme West Tennessee as evidenced in my prior post. 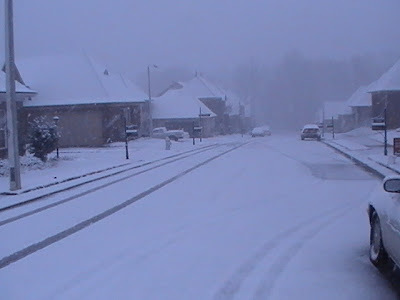 Here in the Cookeville area, we don't expect to see any snow until late tonight. Temperatures are, however, dropping across Middle Tennessee at this hour. 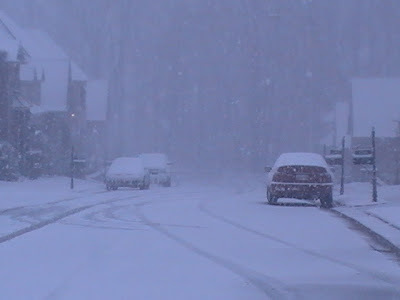 Remember, the NWS-NASHVILLE is only predicting around 1/2 inch of snow here in Cookeville, so don't get too upset if we don't have that much by in the morning!! This is a tricky system for the computer models to predict. Some people will be REAL HAPPY with much more accumulation than expected while some will be disappointed! The latest forecast should be out in a little while and I'll post it once released. How much more are they expecting? 3-4 inches total isn't out of the question for most of Memphis. Are we still expecting 1-2 inches? Any update on the video forecasts? Around 1" here ED...I did talk to someone today about video forecasts and had a good conversation yesterday about the same. Nothing set in stone as of yet sir, but thanks for asking! 5 inches already in Memphis? Wow! I'll be interested to see what you have to say in the morning about how much they got! !